zmnypit had the most liked content! I have two more taillight adapters built and I think thats going to be it for now. There isnt as many taillight swaps happening anymore so clearing out whats left. I'll continue building the headlight adapters so no worries there. Thanks!! Pollen has it covered an hr later. PM BringTheRain403 He's looking at selling his setup. My adapters included with his lights. Easily $1000-$1200 with the adapters. Maybe more on eBay but fees. Someone text me the other day looking for a set. They didn't tell me who they were but I told them this morn check with you. Wish I couldve found a 2500 that color!! After spending 2 days cutting and buffing. New wheels will be installed today if the rain hold off. Thats correct only one style of the denali/SLT light. All the same plug and pin out on both versions. There is however a chrome version of the SLT/Denali light but I've only seen one set so far since 2016. There are two different lights. One in the SLE are HID with center halogen turn signal. 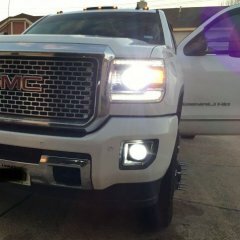 They SLT/Denali lights are all LED with a GMC logo in the center and LED turn signal. 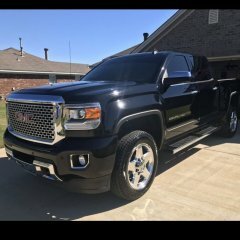 Either will work in the 2500 SLT/Denali trucks with factory DRL. Either will work with the adapters and there is a noticeable price difference between the two. If anyone is interested heres a night time pic of the LED headlights. My windshield has 50% tint as as well. If anyone is wanting to do this swap and hasnt seen my thread in the 1500 section PM me. I offer adapters for the headlights and taillights.